The SuperKote Industrial Laminator is designed to handle oversize graphics, yet is just the right size for everyday applications. The SuperKote Industrial Laminator is a heavy-duty, industrial strength machine capable of accepting board stock up to 1/2" thick. It is ideal for quick print shops, graphic houses, service bureaus and much more. 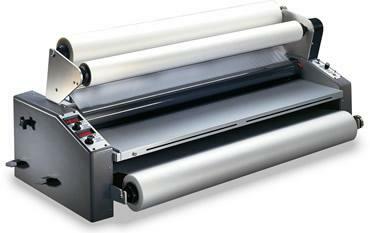 SuperKote laminators are made in the U.S.A.
Accommodates substrates up to 1/2" thick. In-Line slitter- allows document trimming during lamination. Variable roller pressure accommodates a wide range of different film stocks. Adjustable tension to assure controlled, smooth, even lamination. Independent upper & lower electronic temperature control with digital LED display. "Ready", "Wait" lights - "Ready" indicates when the laminator has reached pre-set temperature. Heavy-duty 2" top-grade silicone rubber rollers. Heavy-duty chain & sprocket drive. Teflon Heat Shoe designed for easy cleaning and scratch-free lamination. Waste rewind feature allows single side lamination of pressure sensitive films. Depth (with feed tray): 24"
Footswitch: provides hands free operation for guiding materials during lamination. Footage Counter: used to track laminating film usage.